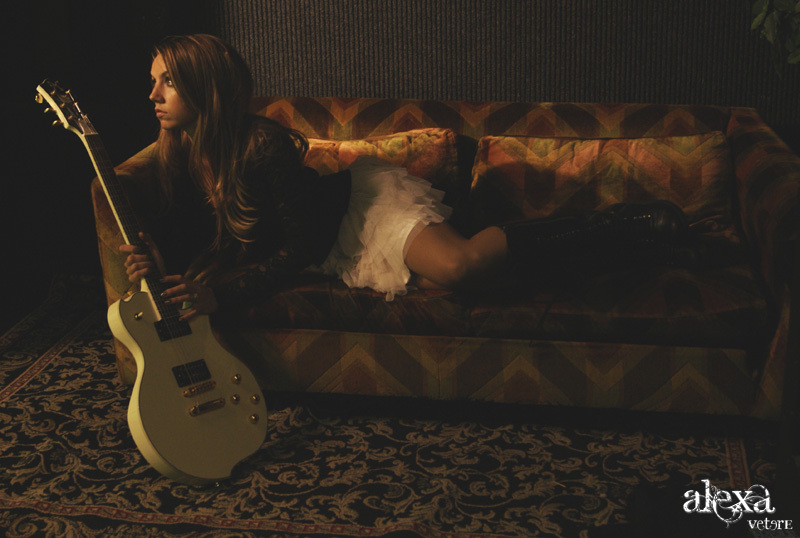 Alexa Vetere, is a fresh new face in the world of Rock N Roll. She can be compared with acts like Hole , Bumblefoot and Pretty Reckless! 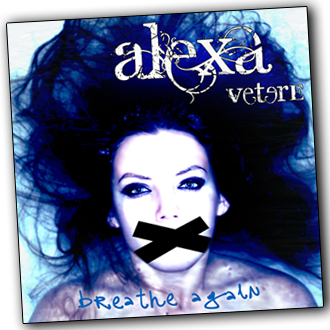 With help of her tutor, friend Ron Thal , she made a hell of a debut “Breathe Again”, wich can be found here ! I got the honor to interview her by mail and this is what she has to say! Hi Alexa, can you introduce yourself to our readers? Hello readers! This is Alexa Vetere – I’m a 24 year old New York singer/guitarist that just released an album ‘Breathe Again’ co-written and produced by G N’R guitarist Ron ‘Bumblefoot’ Thal. On the website: http://www.reverbnation.com/alexavetere there are already some songs available to listen to. Can you describe what your inspiration to write these songs was? This album is a journey of 5 years of inspiration, each song from a different experience. ‘Breathe Again’ and ‘Broken Silence’ were inspired by the loss of friend to suicide. I was pretty young when it happened and those songs were how I dealt with it. ‘Because’ was actually inspired by an eleven year old girl who wrote me a letter saying how much she looked up to me. It was such a moving this letter that I couldn’t stop thinking about her and it turned into a song. ‘Slowly’ was a song written about having to go away from home and my musical support to Tampa, FL for college. I wasn’t too happy about the move, but I guess everything happens for a reason- I ended up where I needed to be. ‘Best Worst Friend’ – self explanatory ;), just one of those friends that it was more about ‘her’ than ‘us’. ‘I’m Sorry’ was a song written for when the words “I’m sorry” don’t seem to cut it, but it’s the only thing you can say, no excuses and no reasons. “Nothing” and “Out of You” where pulled from experiences about people that were hurtful. One was actually inspired by a boss (and I thought friend) that did the wrong thing by me. The other, about an ending relationship. Which song on the album stands out the most for you and why? I love each song for its own reasoning, picking one that stands out is like picking which one of you kids is your favourite! That being said, my favourite kid is the title track ‘Breathe Again’ 😉 It’s the song that is the most personal to me, it came from a darker place then the rest. When I was in high school, a friend of mine committed suicide. It was so out of the blue, unexpected (I suppose it always is, right?) Anyway, the song came from that grieving place where you can’t seem to move forward and you wish you could go back. I think the song really captured the emotion and is something anyone who has grieved can relate to. If you look to the near future what are the three milestones you’d like to achieve in your career? Three milestones?I can’t even run a mile 😉 First, I hope to be able to keep playing and making music. Second, I’d love to come out and play Europe. And third, I’d love to make music for the soundtrack of a movie! You got picked up by Bumblefoot a couple of years back, and he gave you some lessons in guitar and singing, can you enlighten us how you came in contact with him. When I was a kid, about 14, I went to a local bar with my dad (a guitarist and avid music fan) to see a friend’s band. We did this every Tuesday night together, but this one Tuesday stands out more than the rest. I remember sitting there with my dad, thinking about how I couldn’t WAIT to start taking bass lessons, when this guy got on stage with a crazy yellow-winged-foot guitar. In a matter of seconds, I turned to my dad and told him to “forget bass – I wanted to play just like ‘that guy’, and wanted to learn FROM ‘that guy’.” Long story short, a few weeks later I was at the mercy of torturous guitar and vocal exercises, learning to write songs, and eating wasabi covered peanuts with my teacher, Bumblefoot. You already got Dennis Leeflang and Bumblefoot on your debut-album “Breathe Again”. Are there other artists you wish to collaborate with in the future? I am one lucky girl – to play with these guys, I don’t think it gets much better. Not to say I’m not open to collaborations, I’m just still in awe that I created this work with two of the most talented people in the industry! Which band/artist inspired you to go and make music? You are somewhat new in the music business, is it hard to get yourself noticed these days in this hectic industry? Did you already have a “Spinal Tap moment” you wish to share with us? Well, no past drummers have spontaneously combusted yet…but I do play my guitar on eleven. Will there be a chance we can see you perform in Europe in the near future? I would LOVE to play Europe!! Hopefully I get to, the sooner the better. Thanks for answering these questions! Is there anything you wish to share with our readers? Just THANK YOU for reading!